Bodhayana, the Vrittikara, was the first commentator on the Brahma Sutras, a well-known Rishi and a contemporary of Vyasa, from whom Sri Ramanuja makes quotation here and there. Then come Brahmanandi, the Vakyakara and Dramidacharya - the Bhashyakara, Vamana - the Tikakara on Dramida Bhashya, about whom references are made not only by Sri Ramanuja but also by Yamunacharya his predecessor and Sudarshanacharya who wrote an every wide and brilliant commentary on [Ramanujacharya's Sri Bhashya]. Now I'm aware of references in the works of Sri Vaishnava Acharyas and others to most of these figures. I provide quotes from Baudhayana/Upavarsha, the Vrittikara, in my answer here. I provide a quote from Tanka/Brahmanandi, the Vakyakara, in my question here. And I provide a quote from Dramidacharya, the Bhashyakara who wrote a commentary on Tanka's Vakya, in my answer here. 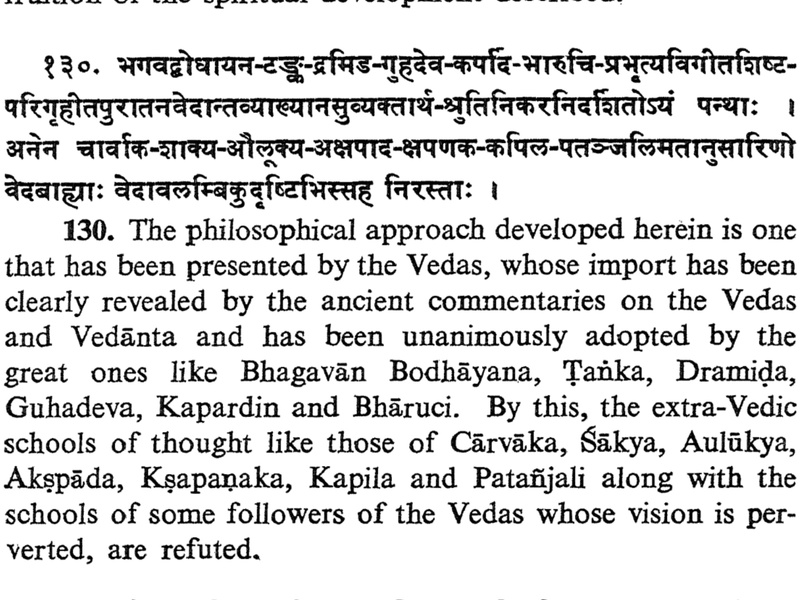 But my question is, what references are there to Vamana, the Tikakara who wrote a commentary on Dramidacharya's Bhashya? The philosophical approach herein is one that has been presented by the Vedas, whose import has been clearly revealed by the ancient commentaries on the Vedas and Vedanta and has been unanimously adopted by the great ones like Bhagavan Bodhayana, Tanka, Dramida, Guhadeva, Kapardin and Bharuchi. So Vamana isn't mentioned, unless he's mentioned under a different names. By the way, are there any surviving quotes from Vamana's Tika, just as the surviving quotes from Baudhayana's Vritti, Tanka's Vakya, and Dramidacharya's Bhashya? Browse other questions tagged history vedanta vaishnavism sri-vaishnava brahma-sutras .